Swansea City striker Wilfried Bony says he will sign a new contract when he returns from international duty with the Ivory Coast. Bony, 25, admits he was tempted to leave when he was linked with clubs such as Arsenal and Liverpool in July. But manager Garry Monk insisted Bony was not for sale, and the striker himself is now happy to stay. "Yes [I was tempted] but for me it's the past and not important now. I don't think about that now," said Bony. Bony has been in talks about extending his current deal, which was set to be signed before the 2-1 win over Arsenal. The paperwork is taking longer than expected, but Bony and the Swans are confident the contract will be signed after the international break. "It's something I wanted. It will be done when I come back," said Bony. Bony joined Swansea from Vitesse Arnhem for a club-record fee of £12m in 2012 and the striker still has three years left on his current deal. After scoring 25 goals in his first season, the Ivorian was linked with a move away from the Liberty Stadium. 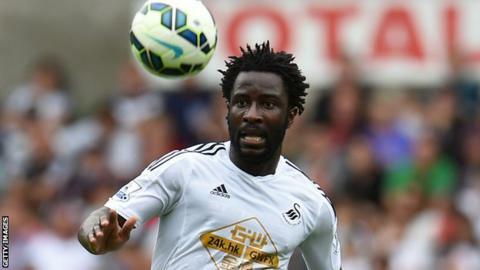 But it now seems that Bony will remain at City, which Swans manager Monk believes will be important for the Welsh club. "This contract is obviously a symbol of how much he enjoys being here," said Monk. "It's a symbol of how committed he is to the club. It's a very big thing for him, the club and also his team-mates. "It is nice to see such a good player and a big character in the changing room commit to the club and the team and it will be a big boost for everyone." Bony will return to Swansea after the Ivory Coast face Sierra Leone on Friday, 14 November and Cameroon on Wednesday, 19 November. The Elephants' first match was originally scheduled to be played in Sierra Leone, but concerns about the Ebola virus mean the fixture will now be played in Ivory Coast. Swansea visit Manchester City on Saturday, 22 November in their first match after the international break. Monk also revealed that he had not had a chance to speak to striker Michu amid speculation the Spain international could be returning from his loan at Napoli. The 28-year-old joined the Italian outfit in July on a season-long loan with an agreed option to buy, but has failed to score in five appearances for Rafa Benitez's side. Michu has been ruled out for two weeks with a recurrence of the ankle problem that plagued him at Swansea. "This is the first I've heard of it. It's pretty much media speculation at this point," Monk said. "I spoke to Michu at the start of the season and things were fine. I haven't spoken with him recently. "We'll have a chat soon with Michu and see what the situation is with these reports coming out and we'll assess it then. "I'm not sure contractually whether we could bring him back and we'd have to check fine lines before dealing with something like that."